The review has concluded a commission of investigation does not need to be established. Stephen Teap with Vicky Phelan, one of the women affected by the controversy. 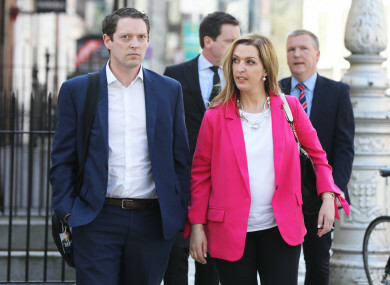 STEPHEN TEAP, THE husband of one of the women affected by the Cervical Check scandal, has said the leaking of a report into to the controversy is disrespectful. A number of news reports this morning revealed the review conducted by Dr Gabriel Scally has concluded that a commission of investigation does not need to be established. RTÉ reports Scally has determined he has “uncovered what needs to be uncovered” and that the system should now be repaired with his recommendations rather than wait years for a commission to report back. A briefing to some of those affected on the findings and recommendations was due to take place tomorrow. “Truthfully I don’t know who leaked it, I’d like to know who leaked it,” he said, adding that he would be attempting to find out. However he said that was not his priority today. He said he is attempting to arrange for Stephen Teap, Lorraine Walsh and Vicky Phelan to meet with Dr Scally today instead of the planned meeting tomorrow. Harris also said he has “yet to see anything reported that is one of the 50 key recommendations” in the review. He described the report as “very significant” and said implementing all of the recommendations will require a lot of work. When asked about the prospect of a commission of investigation now, based on Dr Scally’s opinion, Harris said the government and opposition had agreed that course of action and it will only change if the Oireachtas decides a commission is not required. Lorraine Walsh, one of the women affected and one of three people due to be briefed on the report tomorrow, said it was “heartbreaking and so disappointing” to see details of the review in the media this morning. She said Vicky Phelan was due to have treatment tomorrow and had been trying to rearrange that so she could attend the meeting. Walsh said she wanted to see the full recommendations before forming a view o the commission of investigation. She said this was the point of the meeting with Scally – so that the women and their families could understand his findings and views before they were public knowledge. We spoke to him throughout summer on this and if he is recommending or his view is that there is no need for a commission of inquiry I assume from that he has significant findings in his report. “It’s a disgrace that women and families affected by this are waking up to this in multiple papers this morning,” Kelly said. Email “'Heartbroken at the disrespect shown': Criticism after leak of Cervical Check review”. Feedback on “'Heartbroken at the disrespect shown': Criticism after leak of Cervical Check review”.